"The last question I was asked during my interview for the job was whether I'd be willing to travel. I said no." Jenny Whitlow took the job at Verizon. But after being forced to travel as much as six months out of the year, she's on strike. Whitlow is one of more than 36,000 Verizon workers who are striking over poor working conditions. 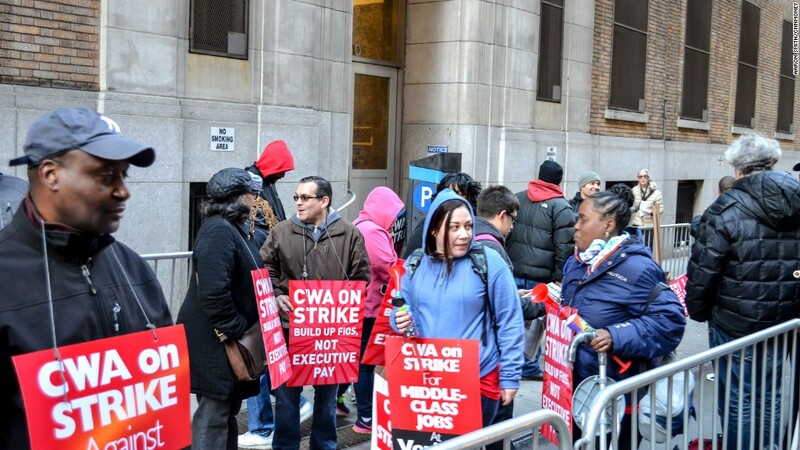 Earlier in April, the group's labor union, Communications Workers of America, failed to reach a new labor agreement with Verizon (VZ) before the existing contract expired. Workers are upset that thousands of jobs have been moved overseas, work is being outsourced to low-wage, non-union workers and that they have to work far from home for much of the year. Verizon's service extends from Massachusetts to Virginia. According to union reps, workers are sent all over on temporary work trips. Verizon spokesman Richard Young wouldn't say how far workers travel, or comment on the company's travel policy. He did say that sending workers out of state is "very difficult," but that the company has to have the flexibility to send workers where they're needed. Whitlow lives in Virginia, and says she has routinely been sent to work in other parts of the state that are two or three hours from her home. She's not alone. Technicians often have to drive their company trucks to work in remote areas where they're posted for a couple weeks. They stay in hotels and get about $35 a day for meals. Sometimes they make overtime, but it's not guaranteed. Whitlow, who is a cable maintenance technician who made $67,000 last year, has been working remotely off-and-on since her son was two years old. He's now 15. "Emotionally, it has a big impact," she said. "I've missed a lot of firsts, a lot of school events, ballgames." Her last work trip was about a month ago. She says they used to last a month but now they're two-week blocks. Still, the time away from home adds up. Last year, she was away for a total of three or four months. Some years it's been more like five or six. Whitlow said that in addition to putting strain on her son and husband, the time away from home makes her feel guilty. "You're doing this to give your family insurance and support, but as a mother, there's such a feeling of guilt." Jenny Whitlow, third from the left, gathers with other striking Verizon workers. Whitlow also described an incident with her mother who was hospitalized while she was away. Whitlow rushed home from where she was stationed three hours away. She got to the hospital but not before her mother was put on a device that prevented her from speaking. Whitlow said she never got to have a final conversation with her mother, who died three weeks later. "It used to be my goal to be happy but I've given that up," Whitlow said. "Now, I'm just trying to survive." Dan Hylton, a technician also based out of Roanoke, Virginia, has worked at Verizon for over 20 years. Last year, he made about $85,000. He often volunteered to work out of state during emergency situations like Hurricane Katrina, when storms led to widespread service interruptions. That was until 2014, when his wife had five massive blood clots that left her with nerve damage and in need of constant care. Hylton often has to take unpaid time off from work to help with his wife's pain management and doctor's visits. Hylton was able to work locally for about a year because of her condition thanks to the Family and Medical Leave Act. But, in December 2015, he was told his exemption through the FMLA wouldn't be honored anymore and he would be put back into the pool of workers who can be sent to work remotely. "Having to move out of town for long periods of time is something I literally cannot do because of my wife," Hylton said. "At that point I'd have to quit my job." 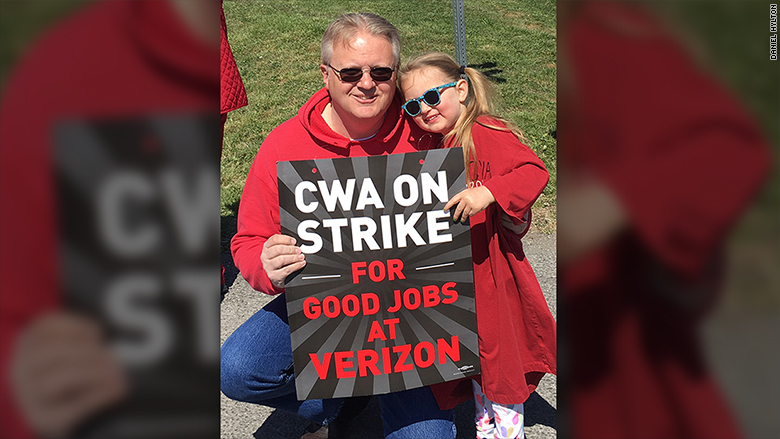 Verizon worker Dan Hylton is shown striking with his granddaughter. He was so unhappy with working conditions at Verizon that he wrote an open letter to the company on Medium, stressing that Verizon was using it workers like "tools." Hylton added that he isn't "anybody special" -- other technicians also have their lives upended when they're sent out of town for work. He said he's striking for the right to "a decent middle class" lifestyle. "We're not greedy people," Hylton said.